Starting tomorrow morning, PBOT crews will begin switching out the 35 mph signage on Outer Division to 30 mph signs. Photo by Dylan Rivera, Portland Bureau of Transportation. (March 2, 2017) In a unanimous vote, Portland City Council approved an ordinance that will establish emergency speed limits for portions of Southeast Division Street from SE 82nd Avenue to SE 174th Avenue at the city limits. The new speed on Outer Division will change from 35 to 30 mph. Under Oregon law, a road authority may establish an emergency speed on any road that is different from the existing speed. In 2016 alone, five people died in traffic crashes on SE Division – four people walking and one person driving – and three people sustained life altering injuries. Seven of the collisions occurred on a two-mile stretch between 124th and 156th. For that reason, City Council declared an emergency speed limit on Outer Division. 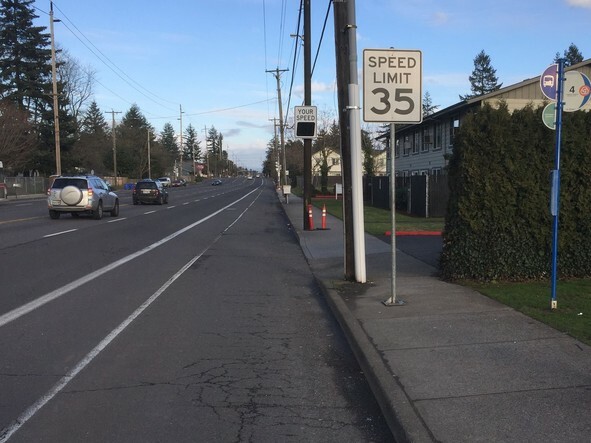 Starting tomorrow morning, PBOT crews will begin switching out the signage on Outer Division to reflect the new speed of 30 mph. Pursuant to ORS 810.180(9), the new speed of 30 mph will go into effect as soon as all new signs have been posted along the corridor. Over 10 years, SE Division has had more crashes that caused fatalities or serious injuries to people driving than any other corridor in the city with a total of 13 deaths and 117 serious injuries. It had the fourth highest total for people walking, and the second highest total for people riding bicycles. Outer SE Division is on the designated High Crash Network due to the high rate of crashes on the street. The traffic deaths and injuries on Outer Division greatly affect the diverse communities in the Jade District, Division Midway Alliance and other communities in East Portland. The ordinance passed at City Council today was an emergency ordinance. Emergency Ordinances take effect immediately. They must be unanimous and at least four Council members must be present to vote.